These awards are available to all Radio Amateurs who submit evidence of having worked 100 approved current entities with no "Deleted" entities, on each band. The 5 HF Band selection is of your own choice totaling 500 entities. 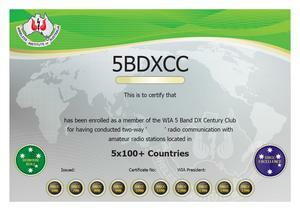 Contact & Confirm a minimum of 100 DXCC entities on each of five (5) HF bands. Endorsements are issued at increments of 100 entities. (Purchased separately) (600, 700, 800, 900, 1000, 1100, 1200, 1300, 1400, 1500). WIA "Honour Roll" achievement is available for reaching a minimum level of 331x5=1655 entities. 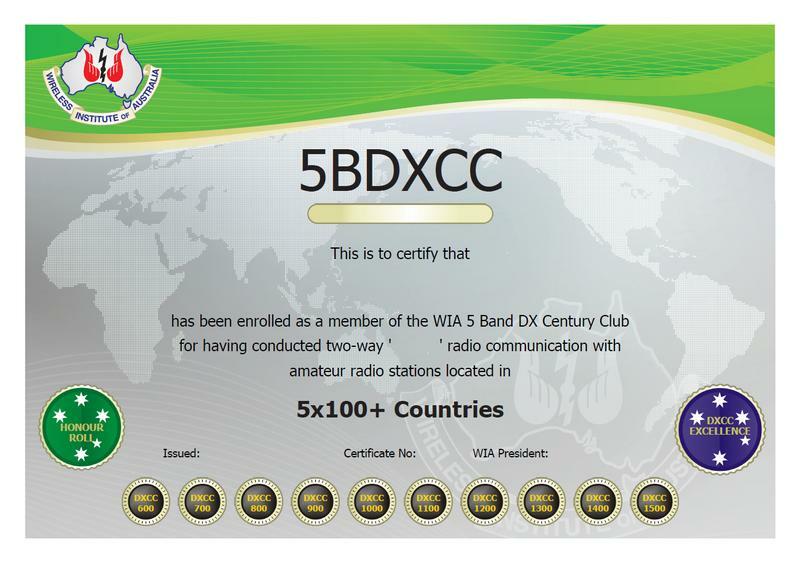 WIA "DXCC Excellence" achievement is available for reaching a minimum level of 340x5=1700 entities.